Need something yummy for dinner tonight? 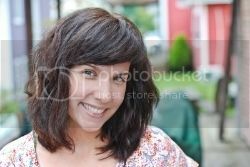 My dear friend Rachel was my lifesaver tonight... as often times she is. It's difficult for me to come up with dishes/what's for dinner. Confession: I'm a HORRIBLE cook, but I'm great at following a recipe. Enjoy friends, please let me know if you try it out! Serves: 4 Prep: 10 min. Cook: 15 min. 1. 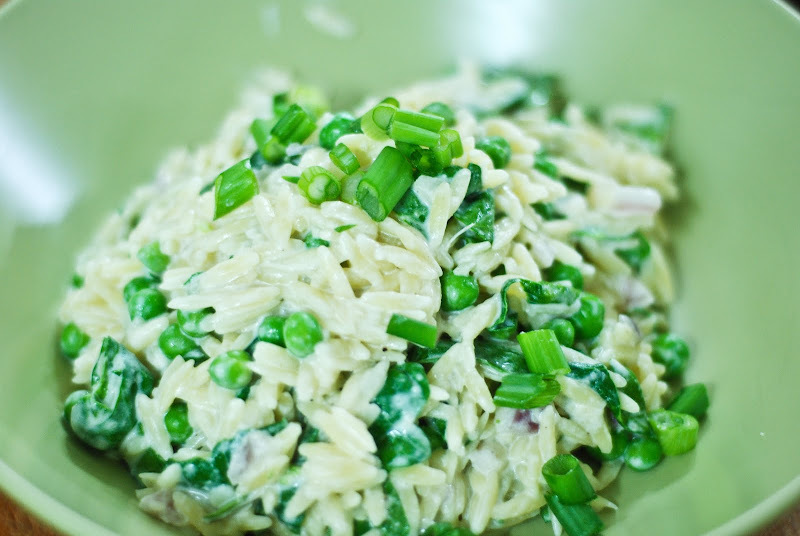 In a large pot of boiling, salted water, cook the orzo until al dente, 8-10 minutes. Drain, reserving 1/2 c. of the pasta cooking water. 3. 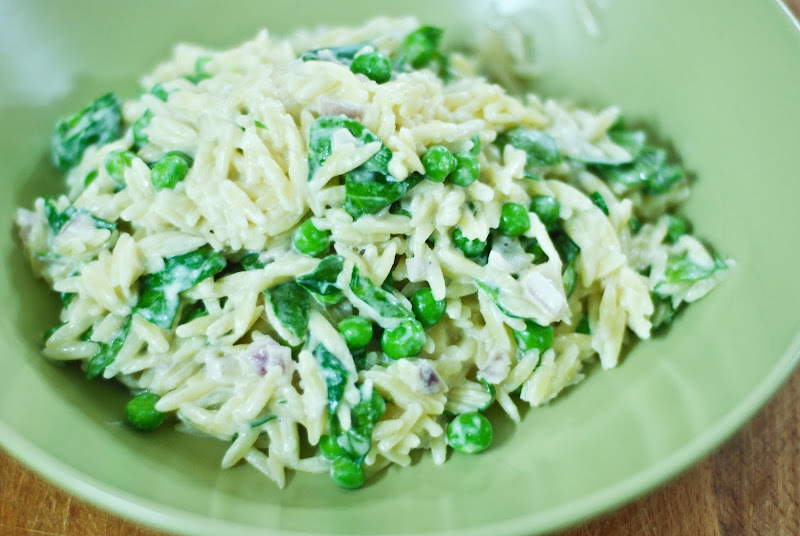 Stir in the cooked orzo, reserved pasta water and the peas; season with salt and pepper. Cook until warmed through. Remove from the heat and fold in the spinach. **I added my only little flair to this dish, by adding garlic. I LOVE garlic, and I think it brings out more flavor... also, I'm thinking it might taste great with celery in it for some reason. 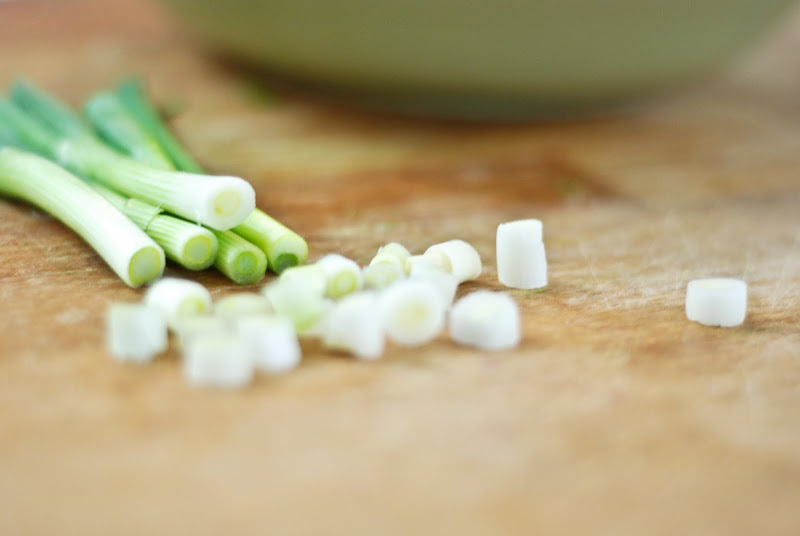 Garnish with remaining parmesan cheese and cut scallions. i'm obsessed with sweet peas. and i love orzo. parmesan, half and half? sign me up. i will be making this- thanks for sharing! Oh wow - this looks amazing! I love risotto!! Thanks so much for sharing! That looks really good ... I've never made orzo - so this'll be fun! You give me hope =) I'm so trying this. Feel free to share more recipes!